Through the auspices of Sino Inn hotel, I was booked anew in another adventure. But this time, the island hopping adventure in Phuket. I chose the Happy Boat Travel. It was a 7 points/3 Islands Tour package for 3,000 Baht/pax. And my pick-up time was 8:00 am. This beach was featured in the movie "The Beach". We stayed in the beach for 45 minutes. Notice the milky-white sand of Maya Bay! This is the reason why the movie "The Beach" was shot here. Loh Samah Bay and I did! It was a 10-15 minute walk depending on your pacing. But once you are there, you will forget the effort you made. It took us less than 15 minutes from Maya Bay before reaching the lagoon. We were told to take only pictures in the lagoon as the speedboat will not stop in the lagoon. From Pileh Lagoon, only a 10 minute cruise to see the cave. According to our guide, the cave is 400 years old. It was high tide and this was the closest that we could see the monkeys. We were allowed to throw bananas and feed the monkeys. Five minutes journey only form Viking Cave. It was a buffet eat all you can lunch! We stayed in the island for almost 2 hours. We relaxed on the white sandy beach and did a little bit of snorkeling and swimming. The best part of the tour was that I was seated beside Laura (Australian) in the speedboat and we took pictures of each other and enjoyed the tour. I wandered around the beach and frolic around. We stayed in the island until 4 pm and afterwards went back to the berthing point. We were transferred back to our respective hotels. And the memories lived on.. Adventure Travel in Phang Nga, Thailand! I booked through the help of the hotel and paid 3,500 Baht. I was told that the pick up time was 8:30 am the following day (October 24, 2013). I was delighted to hear that all the pieces were set in order and I took a respite and slept soundly that night. The following day I woke up 7 am and brought the following, namely: sungaless, hat, sunblock lotion, spare t-shirt, shorts, slippers, towel, insect repellant, camera. I was picked up in the hotel on time and we traveled for almost 2 hours before reaching our first stop in Phang Nga. We were given a 5-minute instruction on how to operate the ATV and there we go! We had ATV riding for 30 minutes in the jungle and along the riverbanks. Some of us were sliding and bumping each other while driving the ATV. I could not help but scream as I was enjoying every minute of it!! From the jump-off point, we had to do a 10-minute trekking before reaching the spot. But the scenery along the trek was fascinating, I was awed! We took souvenir photos and wandered around. Some of my tourmates jumped into the water and enjoyed the cool waters of the falls. But I did not join them, I simply took pictures of the place and enjoyed the scenery! Before going to the next spot, we had our group picture photo. Different nationalities, namely: Australian, Arabs, Americans, Russians, Thai, and of course a Filipino! After 1 hour of resting, we went to our next adventure. Fourth Stop - White River Rafting! Another group photo but this time for White River Rafting! It was a 5 kilometer river rafting! I've done this in Cagayan De Oro, Davao and Chico River in the Philippines. But the thrill of it still boosts my adrenalin every time I'm onboard the raft. It was a 30-minute trekking along the muddy, rugged and perilous trail in the jungle. I even screamed like Tarzan while I was elephant trekking. I was having the time of my life!! This is one adventure I will never forget! I entered the Suwan Khuha Temple and was amazed of the structures inside. After the temple visit, we were transferred to our respective hotels. We bid goodbyes to each other. From Johor Bahru, Malaysia, I went to Melaka. Originally, the plan was going to Kuala Lumpur. But the six hour travel is too much to bear and so I decided to go instead to Melaka. From Singapore, I rode a bus to JB, Malaysia. Reaching JB Sentral, I hired a taxi to Legoland for 100 RM. Then, from Legoland, another taxi ride to Larkin Station for 150 RM. And from Larkin Station, I took a bus ride to Melaka for almost 4 hours for 25 RM. By the way, there is a bus (25 RM only) and a train ride from Singapore direct to Melaka. I just needed to drop by in Legoland. Many long-distance express buses connect Malacca with both Kuala Lumpur, Seremban, Johor Bahru, Singapore and other parts of Peninsular Malaysia. All long-distance and local buses now operate from the Melaka Sentral bus terminal, a good 4.5 km from the historic core of the city. Express buses will also drop you off at Malacca Central/Melaka Sentral. The famous bus operators in Melaka includes Delima Express, 707 Express and Transnasional. Reaching Melaka Sentral, I hired a taxi ride to my guest house for 25 RM. There are so many guest houses in Melaka such as Jalan-Jalan Guest House (www.jalanjalanguesthouse.com / jalanjalanguesthouse@yahoo.com) and Sayang Sayang Guest House. But my Singaporean friend told me to go instead to Kawan-Kawan (606) 281 8272 / www.kawankawan.com.my / 012-219-6788 / 012-973-8923 / 019-657-2728) No. 36 Jalan Tukang Besi 75200 Melaka (near Hard Rock Cafe). I paid only 70 RM for the accommodation. It was past 3 pm when I reached Melaka and I rested a bit and started walking and exploring Melaka. Malacca or Melaka is the capital of the state of Malacca, on the west coast of Malaysia. It is rich in historical and cultural background from previous Portuguese, Dutch and British rule. The city center was listed by UNESCO as a World Heritage Site in July 2008, along with Geogetown, Penang, Malaysia. 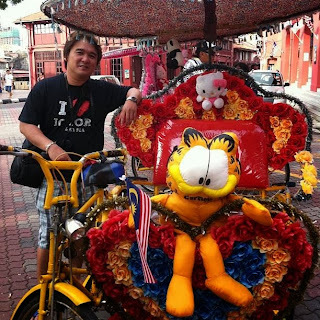 When you are in Melaka, you can ride the Becca as part of your tour of Melaka. It is better yo have the Melaka Street Map and/or the Jonker Street Map before starting with your street walking adventure. Here are the spots that you should not miss! All the walking made me hungry and I was tempted to eat in one of the best restaurants in Melaka! I had to taste the famous Chicken Rice Ball! And finally, it was a good thing it was a Sunday that day because from Friday to Sunday they have the Jonker Walk Night Market. (6pm - 12 am at Jalan Hang Jebat)and I truly enjoyed this experience in Melaka!